Even as you delve into this BT collector's edition on 100-year-old companies, doff your hat to M.F. Husain, 95, who passed away on June 9, leaving behind a rich artistic legacy. India's largest private sector company, Reliance Industries, or RIL, has entered the insurance sector. RIL and its associate, Reliance Industrial Infrastructure, will buy Bharti Enterprise's entire 74 per cent stake in Bharti AXA Life Insurance Co. and Bharti AXA General Insurance Co. AXA will retain its current shareholding and continue to manage the dayto-day operations. Bharti AXA Life has been struggling with a market share of only one per cent. Tata Steel has sold its 26.27% stake in Australian coal miner Riversdale to global mining major Rio Tinto for A$1.06 billion (Rs 5,074 crore), while holding on to its 35 per cent stake in Riversdale Energy (Mauritius), a Riversdale subsidiary with coal assets in Mozambique. Tata's Mozambique JV with Riversdale gives it rights over 40% of the coal mined at the Benga coal project in Mozambique. Samsung Electronics Co. will become the world's largest smartphone maker this quarter, overtaking struggling Nokia, which led the market since 1996, Nomura said. In the next quarter, Nomura also sees Apple moving ahead of Nokia. In India, Samsung has already surpassed LG. Succession issues are dominating boardrooms across the world. In India, ITC's 100th annual general meeting on July 29 will deliberate on a five-year extension for Y.C. Deveshwar as Chairman and Chief Executive. Deveshwar may serve a part of his extended term as non-executive chairman. Infosys colossus N.R. Narayana Murthy addressed his last annual general meeting at the company on June 11. For new Chairman K.V. Kamath and Co-Chairman Kris Gopalakrishnan, he leaves behind a $6-billion behemoth with over 130,000 employees. For the record, the company has given away stock options worth Rs 50,000 crore to its employees in the last 30 years. Today, Infosys has over 450,000 investors, and has made many a middle class Indian a millionaire. A hard act to follow. US securities regulators are examining whether Goldman Sachs and other financial firms violated bribery laws in their dealings with Libya's sovereign wealth fund. Enforcement lawyers at the Securities and Exchange Commission are reviewing documents that detail the firms' relationships with the Libyan Investment Authority controlled by Col. Gaddafi. International Business Machines, celebrating its centennial year, is mulling over who will replace its Chief Executive Samuel J. Palmisano. The frontrunner is sales chief Virginia M. Rometty. A president or operating chief may also be in place in a year. Though she has denied she is interested, there is speculation that US Secretary of State Hillary Clinton may take up another job next year. The top slot at the World Bank will fall vacant if current chief Robert Zoellick quits at the end of his term in mid-2012, and Clinton is tipped to succeed him. Meanwhile, the International Monetary Fund chief's position is still to be filled. The Reserve Bank has raised interest rates for the tenth time since March 2010 and said it will persist in its battle against stubbornly high infl ation. The central bank downplayed worries about slowing growth in India, Asia's third-largest economy. 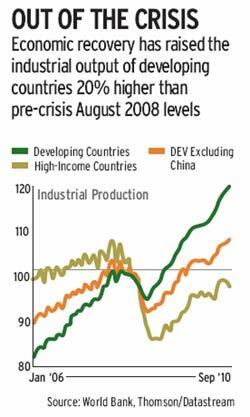 Economic recovery has raised the industrial output of developing countries 20% higher than pre-crisis August 2008 levels. Advance tax payment by India Inc. presents a slightly alarming picture of the economy in tandem with a big fall in April IIP numbers. The largest lender SBI leads the pack, paying Rs 1,100 crore against Rs 850 crore in the year-ago period. RIL paid Rs 900 crore in the first quarter of 2011/12, up nearly 50 per cent from Rs 650 crore in the year-ago quarter. The government has extended the popular exports scheme - the Duty Entitlement Pass Book, or DEPB - until September after which it will be replaced by duty drawback. Rs 260 cr Air India's dues cleared by the government, out of a total of Rs 1,100 crore on account of services provided by the public sector carrier, such as providing the jets chartered for VVIP movements and Haj operations. 6.3% India's industrial growth in April, the lowest in seven months, down from 13.8%. for the same month last year. Manufacturing was the main culprit, falling to 6.9% from 14.4% a year ago. 57% Record growth in India's merchandise exports in May, which touched $26 billion due to a fine performance by the engineering, oil and electronics sectors. But imports too jumped to a four-year high at $41 billion. Facebook is likely to file an IPO by the first quarter of 2012, with a valuation of over $100 billion. It is set to cross the 500-investor threshold, that triggers the mandatory release of quarterly financial information to the Securities and Exchange Commission. Commodity markets regulator Forward Markets Commission, or FMC, has plans to allow forward trading in metal and agricultural produce on the National Spot Exchange, or NSEL, according to FMC Chairman B.C. Khatua. NSEL trades in 34 metal and agricultural commodities and records a daily turnover of Rs 1,000 crore. A Crisil study has found that two-thirds of the qualified institutional placement issues in 2010 have given negative returns. Thirtythree out of the 50 issues were trading below their offer price as on June 3, 2011. There seems to be no end to labour troubles afflicting the transport sector. The strike at Maruti's Manesar plant may have ended, but it is now the turn of dock workers to threaten an agitation. Shipping Minister G.K. Vasan has invited labour unions of major ports for talks on corporatisation of the Jawaharlal Nehru Port Trust, or JNPT, in Navi Mumbai, the thirdlargest Indian port by traffic volume, on June 23. Trade unions have threatened a strike if the corporatisation plan is not abandoned. Corporatisation will ensure an independent JNPT board with powers to take financial and management decisions.